Incredibly quiet, wonderfully light and with ionic grill. The Gamma Piu Relax Power Dryer is the quietest salon hair dryer in its class. Its 2100-watt motor produces an airflow of 93.6 m3/h, but doesn't go above 68 dB. The special nozzles can maintain the airflow at maximum temperature and the grill coated in Tourmaline ionizes the air itself, meaning that hair is made more shiny and manageable. Hair is revitalised and drying time is reduced. This design also boasts reduced airborne vibration and magnetism. Comes with a salon-friendly 3-m cord. 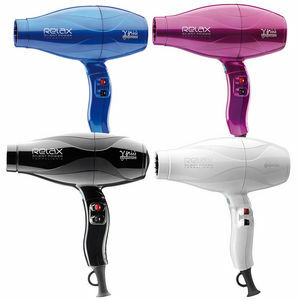 The Gamma Piu Relax Power Dryer is available in 4 colours: Black, Shiny Fuchsia, Shiny Sky Blue and White. £104.39 (inc. VAT) Why no VAT? We're a trade wholesaler and quote our prices without VAT to help our VAT-registered customers understand the true cost of a purchase.